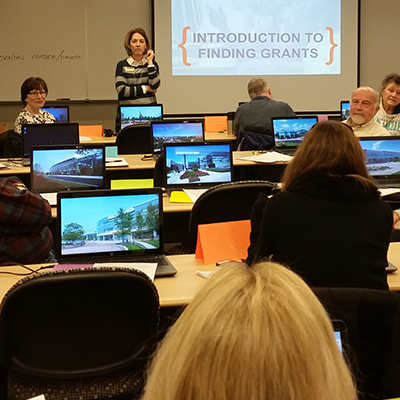 Artists and leaders from local arts organizations were recently given the opportunity to explore avenues of funding at Arts DuPage's Introduction to Finding Grants for Not-for-Profit Arts Organizations workshop held on January 18. Offered off-site at College of DuPage’s Student Resource Center, the session offered insight not only into the world of grant finding, but to the body of valuable resources open to the community through the college. The attendees, 25 in total representing 19 arts organizations, discovered research tools that would enable them to find sources of income for their particular niche. In a follow-up evaluation survey, the workshop earned extremely high marks for content, presentation, and overall effectiveness while class leader Christine Kickels received a rating of 100% for her knowledge of subject. Based on the positive feedback, plans are being made to partner again with COD. Topics such as board recruitment, marketing, grant writing, and donor cultivation have been earmarked for future workshops.